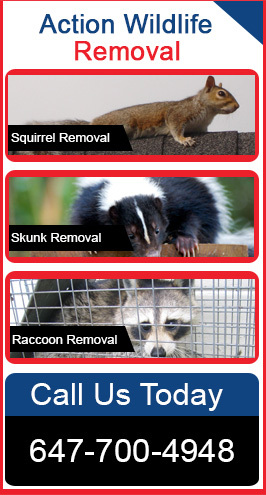 Action Wildlife Removal has a team of skunk removal experts serving Mississauga, Brampton, Orangeville, Caledon, Bolton, Guelph & Georgetown. Our wildlife removal company prides itself in knowing the commitment to the safe and humane removal of all animals, including skunks. Skunks may carry rabies and humans should definitely avoid any skunks showing very friendly behavior, since one of the characteristics of rabies in animals is a loss of fear of humans. Skunks can also be infected by a host for various other parasites. Confronting skunks should be left to wildlife removal and control experts. Some home and property owners use cayenne pepper and moth balls to remove or prevent skunks. This is all nonsense and if it has successfully worked for you it can only be associated to luck. The removal of skunks can be frustrating and time consuming as these notorious little creatures are relentless and keep returning again and again. The permanent solution is to call a professional wildlife removal company and book an in-house inspection to quickly identify entry as well as future problem areas. Do you have skunks living under a deck/shed/foundation/addition? If yes, then you should contact our professional skunk removal services to help solve your problems. Our wildlife experts can quickly identify current as well as future problem areas. We prefer not to come into direct contact with problem animals and skunks are one of them. For this reason we will remove skunks much the same as any other wildlife is removed humanely. Why hire us to handle your skunk removal issue? Complete services from eviction to remediation. Skunks are animals that can carry various disease and parasites which can be dangerous to humans and pets. Please call our professional services now to handle your skunk removal issues. We provide safe, effective and humane skunk removal services so you don’t have to come in contact with a skunk, now or ever again. We serve residents of Mississauga, Brampton, Orangeville, Caledon, Bolton, Guelph & Georgetown. Contact today and ask about for an inspection scheduling.